The old saying is if you have nothing nice to say, you shouldn’t say anything at all. Sadly too many people on the Internet forget about this golden rule. This means your company is always vulnerable to things like Twitter trolls. The majority of companies have some sort of plan of action to handle upset customers. But what should social media managers do when they are constantly harassed, sent inappropriate messages or threatened? You want to recognize your brand loyalists and appreciate the business they bring to you. At the same time, you can’t let a disgruntled person on the Internet pigeonhole you into Twitter fights. Twitter beef between politicians and rappers can be entertaining. As for your brand, you never want to be in that kind of spotlight because it almost always ends negatively. Trolls, cyberbullies, haters or whatever else you want to call them, all usually have one goal–to get under your skin. With 500 million Tweets sent per day, Twitter bullying is a real threat against businesses. Negative people on Twitter have far less consequences than those who actually go into a store to voice their opinions. It’s a lot easier for people to Tweet an immediate reaction without thinking or having a face to the name. This is why it’s critical to avoid sinking to angry customers’ levels. As a social media manager, you’re a major voice for your company. This means customer service skills should always be on your mind. If someone harasses your company’s Twitter feed, don’t respond without thinking things over first. Take a deep breath and think about how you plan to respond. While some Tweets at your company can be hurtful, others could be threats. If a business has a physical threat against them, the company usually has some sort of plan of action. The same should be in place in case someone Tweets a threat. If you have a plan of action, you’re able to address the situation more effectively and cautiously. If your company manages multiple Twitter accounts, it can be difficult to see all the Tweets coming in and out from your company. Businesses with several networks need social media management to ensure each message is appropriate. 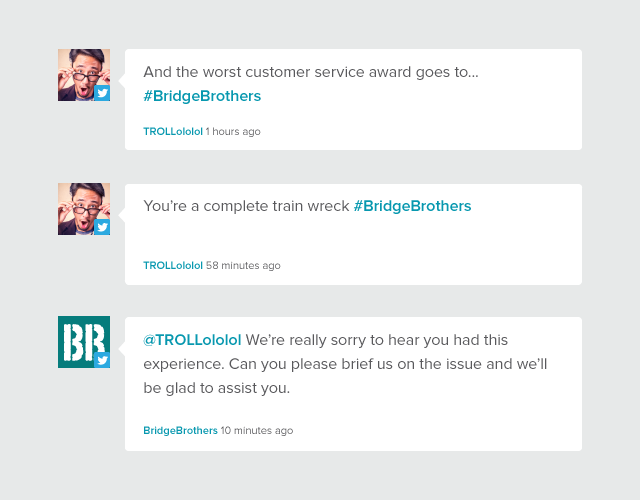 At Sprout Social, we understand that one bad Tweet from your company can do a lot of damage. That’s why we created the Message Approval system that only allows specific users to approve company Tweets before they go out. A well-planned and authorized response to a cyberbully could prevent your company from sending the wrong Tweet. This may be one of the more challenging tasks when dealing with Twitter abuse, but it’s extremely important to avoid giving your audience a reason to send you negative Tweets. For example, in 2013, J.P. Morgan ran a Q&A campaign with the hashtag #AskJPM. The goal was for one of the company’s executives to give helpful career advice. Instead, the backlash of responses was anything but on topic. Be aware of current events and world topics. Be ready to engage with each post. Avoid telling your audience what to do. Be careful deleting posts right away. Each of these actions will help you avoid giving your Twitter trolls fuel for the flame. Twitter is a highly-sensitive area for businesses. It’s almost impossible for businesses to be engaging without some sort of controversy. Things happen and companies make mistakes. It’s important to limit your social media errors, but you can’t be afraid to engage with your customers. Twitter is an extremely helpful tool for your business to listen, engage and analyze your audience. 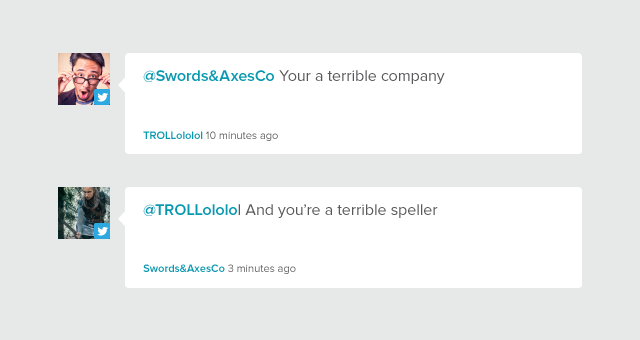 You shouldn’t let a few trolls keep you from your marketing potential. Additionally, you cannot be afraid to respond to an angry customer. If you’re receiving a lengthy Twitter rant, it’s better to address the situation than avoiding it. Reply to the person and thank him or her for the suggestion, comment or input. Then explain how you plan to fix the solution. It’s nearly impossible to resolve all issues right away. So don’t make empty promises that they can use for an attack down the line. If you explain your plan to resolve the issue, there’s not much else to do. This gives you the right to end the conversation if the person continues to pester. If you feel like a customer is just venting on your feed, ask for his or her contact information so you can respond. 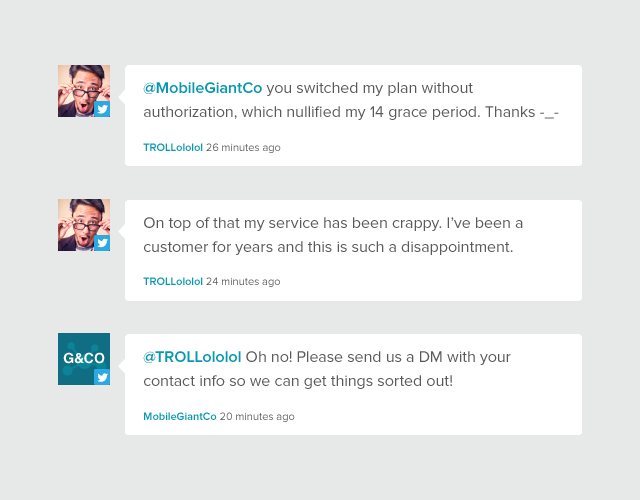 Usually Twitter trolls give up when you treat the situation like any other customer service issue. Always ask for personal information to resolve the issue. Once cyberbullies are put on the spot to reveal personal information, they will likely stop complaining. Also, they tend to change their tone once you have their name. This won’t work every single time as some people are out there just to get a rise or reaction from you. But if you’re uncertain whether or not they are an actual customer or not, the best thing to do is get more information and let them know the next steps. 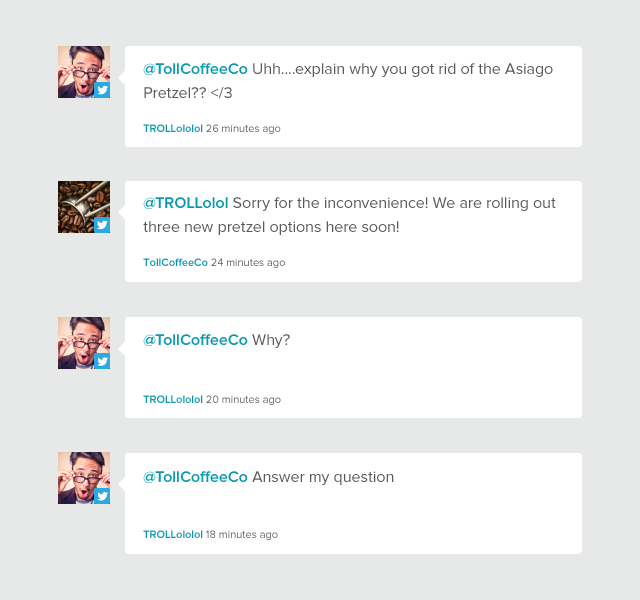 Sometimes, Twitter trolls just want to test your company to see if you’ll respond. Showing your human side makes it much more difficult for haters to send angry Tweets. Some businesses social media presences’ are a funnel for customer service inquiries. They can turn into a place just for people to vent. Most major transit companies receive endless social media tags, @mentions and Tweets each day. In fact, a Georgia Institute of Technology surveyed 130 U.S. and Canadian transit agencies. The institute discovered almost 80% saw social media as a customer feedback tool. However, less than 65% of respondents said they didn’t have the overhead to answer all inbound messages. This is why it’s critical to be transparent. If you’re receiving countless social messages, you have to correctly funnel your Tweets. Otherwise negative messages will cover your networks. This only show others you don’t respond to concerns or questions. By using Sprout Social, you can connect multiple social channels to one single-stream inbox. There you can assign customer service employees incoming messages. Through assigned messages, you show everyone you have a pulse on each concern to come your way. If your social network only shows updates, alerts or changes to the business, you’re only displaying what’s wrong with your company. You need to show some sort of human element to seem more transparent so cyberbullies and other online attackers don’t single your business out. If you’re noticing a trend in Twitter abuse from the same user, you need to keep a record of what they said. If you need to file a police report for harassment or threats, it’s helpful to have a thorough summaries of each interaction. Users considered trolls have few followers and jump to new accounts when their old one gets blocked. It’s important to note any similar tendencies from all Twitter accounts. Then you keep track of each time the person abuses the social network. Through the View Contact option, you can also add notes to users. This makes it easy to log any abuse that comes your way. From the same window, you have the option to report as spam or block user. For companies using Twitter, it’s easy to take things personally. It’s especially hard to keep cool when you’re accused of false information. It becomes a delicate balance between keeping your emotions in tact. At the same time, you want to make sure you admit when you’re in the wrong. Like we said before, being transparent is critical. When you admit you’re in the wrong, it doesn’t quite feed the trolls like it would if you denied guilt. 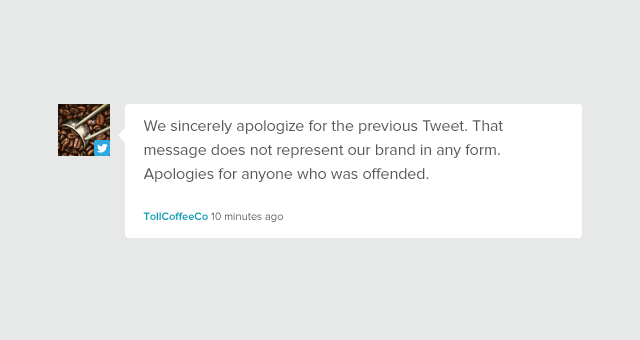 If your company is guilty of something, apologize for the inconvenience. Taking on the criticism shows merit. We are sorry you feel that way. We fully understand your concern. This is not associated with our brand ideas. 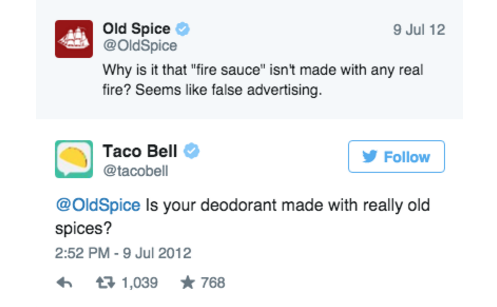 There’s nothing worse than seeing a Twitter beef between brands customers and other businesses. You need to know your limit. Always give your upset customers a place to go to continue with their concern. If you banter back and forth with someone on Twitter, it could make your company look. You’ve got to apologize because it’s the mature and adult thing to do. But you don’t have to continue the conversation once a solution is provided. Our own Community Outreach Manager Sarah Nagel explained how Twitter trolls can be relentless in their tactics. Nagel added it’s not always best to address every single message. You should evaluate each message and ensure there’s some record of the conversation. Keep your responses limited and try to end the conversation once the issue is resolved. If you find out it is in fact a customer, you can check on them weeks in advance to make sure their issue was addressed. If you’re being attacked on Twitter, again, don’t let your emotions get the best of you. You know the saying–haters are gonna hate–so let them sit on it their attacks for awhile and give it time. Even the most persistent trolls eventually give up over time. The best thing to do is avoid giving them fuel to the fire and let the aggression sizzle out. If the harassment continues, reach out to your human resources or legal department. This is especially important if something seems like a serious threat. Remember: Don’t feed the trolls. They’re always hungry and looking for away to make you and your business seem inferior. If you have any anti-troll recommendations, feel free to comment below!